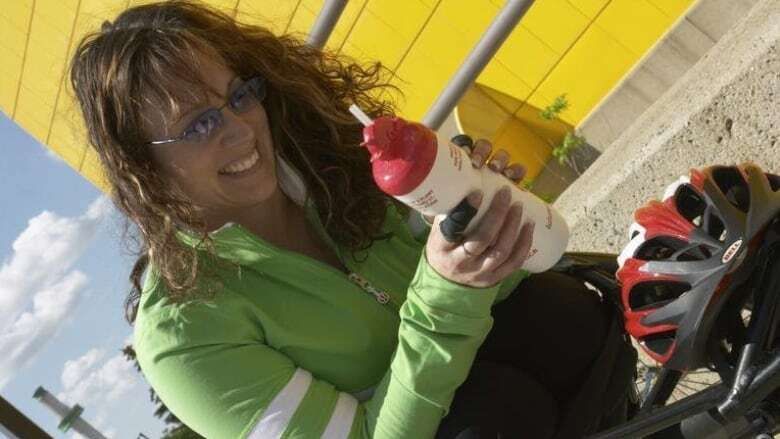 Shauna Jensen was paralyzed from the waist down in a motorbike accident. That's when she found out she was allotted one catheter a day, which she says led to urinary tract infections and a loss of dignity. For years, Shauna Jensen dreaded formal events — all dressed up and rinsing her dirty catheter in a bathroom sink. With each passing moment she would try to rescue a shred of her dignity. Trying to prevent urine from dribbling onto her outfit, trying to sufficiently rinse the scent of urine from the tube she would tuck into the baggy in her clutch purse, praying someone would not be at the sink beside her "horrified by the whole process." "I would feel really degraded. I'd want to go home," recalled the 45-year-old graphic designer, volunteer and athlete, who loves to ride her off-road wheelchair "that basically eats rocks." "That's not how I should feel," she said. "I am a person who is full of life, has always been full of life." The problem is, under provincial rules, Jensen qualifies for just one new catheter a day, or 70 every two months. Jensen "caths" about eight times a day by inserting the plastic tube into a hole in her abdomen — "beautiful and tiny like a red cheerio" — and draining her bladder. The limited supply means rinsing, washing, drying and reusing catheters throughout the day. Despite thoroughly scrubbing with Sunlight (recommended) and scalding water, Jensen said she could not fend off urinary tract infections. But it was the loss of dignity and freedom that bothered her most — being forced to rinse and carry around dirty, "stinking" catheters in her purse, then cleaning them for up to 30 minutes a day. Afterwards she would lay them out to dry on the kitchen table, hoping no one would stop by unexpectedly and that she wouldn't have to urinate in the meantime, which would mean dipping into next week's supply. Not only did it feel "tedious, degrading and embarrassing," but self segregation slowly crept in, Jensen said. "First, I stopped inviting people in because the stinky catheters were still drying on the table, and then I would stop going out because the thought of having to use and rinse a catheter in a public washroom was just too much." A provincial spokesperson said requests can be made for additional catheters but must be backed by clinical evidence. That just means a detailed "pee and poop chart" and more degradation, Jensen scoffed. It's a struggle Jensen could not have imagined before a motorbike accident 14 years ago left her paralyzed from the waist down. She met the challenges of her new life with her usual courage, determination and sense of humour. But was dumbfounded she had to plead for an adequate catheter supply simply to relieve herself. Last fiscal year, Alberta Aids to Daily Living provided catheters to 4,404 clients with multiple sclerosis, spina bifida, spinal cord injuries and other conditions. But years ago Jensen made the life-changing decision to buy her own catheters. Sold to Albertans for $1.66, she buys them in Ontario for about half the price. The additional supply allows her to use a new clean catheter every time. Jensen's infections stopped and, most of all, she relished her restored sense of freedom and dignity. But buying her own catheters amounts to nearly 20 per cent of her disability pension, her only income. Jensen can't work because of excruciating nerve pain, another consequence of her injuries. It also means no eating out and living with her boyfriend in subsidized housing for now. It's been a long time since she's gone on vacation or bought new clothes, she said. Jensen questions why she should have to pay for the right to go to the toilet with dignity, to urinate on her own terms. "It's a natural body function. It's a human right," said Jensen, who hopes by speaking out she'll improve the lives of those who cannot advocate for their needs, or afford to make the choice she did. Bev Matthiessen, executive director of Alberta Committee of Citizens with Disabilities, said for some clients the provincial quota is more than enough but others require additional catheters. Either way, she said an assessment must go beyond clinical evidence. "Perhaps they're working, perhaps they're going to school," said Matthiessen, calling for a more holistic assessment of what a person needs. She plans to raise the point with government officials. The province replied to inquiries with an emailed statement. "Together, we are searching for studies and researching clinical information that will assist in identifying best practices." Jensen hopes future catheter assessments will take into account much more than clinical information, by considering quality of life, freedom and dignity.